When I was about five years old I had a boyfriend named Michael. I went to his house once. It was amazing. They lived out in the country because his dad had a small airplane with a runway out back. Inside his mom was playing a Jim Croce album and had a huge floor loom. She wasn't using it but it had a project on it. That image has stayed in my brain - a big loom against the wall, music playing, smiling people. Sadly I don't remember Michael's last name or know what's happened to him. I just have that one memory. Ever since I've been fascinated with weaving. It's amazing what can be done with a loom and thread. I once had a small table loom, made for children (I was about ten), but it disappeared through the years. My stash of things for being creative does include some small hand looms, but they're kind of awkward to use so I haven't done much with them. So, what does this have to do with anything? 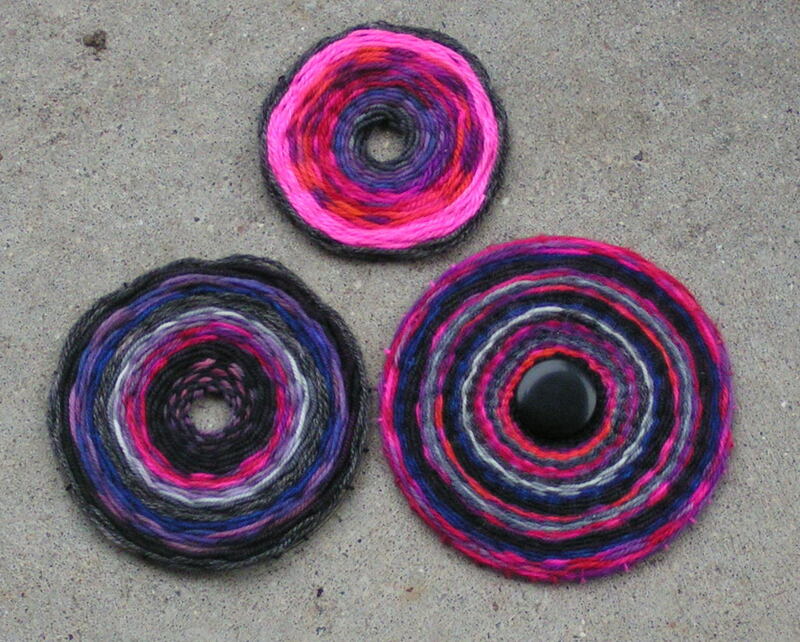 Well, recently on Cassie's blog she showed some CD weaving that her students had done. They look so neat. Then, by shear coincidence, CD weaving was all over my pinterest feed. I listened to the hints and found some unwanted discs in my son's room (he's notorious for not putting them back in their cases, leading to scratches). Add some scraps of leftover sock yarn and voila! I had such a good time making these - and of course I started thinking about other color schemes - ombres and rainbows and striped monochromatics - and things to do with them - magnets for the fridge, glue a pin on the back for a brooch, hang lots on the wall, string together as a window screen - and it hasn't stopped. I even wondered about getting some crappy albums from Goodwill to weave into a huge design. I think they would be really nice around one of those great "God's Eyes" that are yarns wrapped around crossed sticks. No, it's not exactly the same as sitting at a big loom making large wall hangings or blankets, but it's sure fun. And, of course, it's helped me procrastinate more - those gifts still aren't done. I really need to get going on that...after I sew the zipper into the dress I'm making, of course. These are exquisite!!! I have some old CDs- do you have a link at all to how to do them at all (or did I miss it in the post- hmmm,better go back and look!!) So beautiful Bobbi-you are clever! Oh yay! Weaving is fun. I used to be obsessed with it but only for a short while due to little fingers all over my crafts and projects.